Can you believe it? Word Nerd Wednesday is BACK! After an unscheduled hiatus . . . ahem . . .
First, a link over to my Good Things Utah interview that aired live this morning. #1: Where do I put the comma, before the parentheses or after? After Officer Brad spoke to the students (the fifth and sixth graders), he passed out information about Internet safety. After Officer Brad spoke to the students, he passed out information about Internet safety. After Officer Brad spoke to the students he passed out information about Internet safety. Definitely want that comma in there. Put it OUTSIDE the parentheses. MINOR CONFUSION: This makes perfect sense, right? Well, not everything does. When you're dealing with quotation marks, you almost always put the commas or other punctuation INSIDE, even if they aren't part of the quote. Gotta love how consistently random American English is. #2: Do you capitalize the "n" in "not"? The first and last word, regardless of what they are. Three words, so the first and last get caps. The middle word is a preposition, but it's long, so it gets caps too. Cap at even though it's a preposition, because it's the first word. Don't cap the. Cap the other two big words. Only the first and last words get it, because the middle two are a preposition and an article. First and last. The middle word is too small to matter. See how that works? Pretty simple. #3 When using colons, do you capitalize the first word that comes after them? Mark read over his grocery list: bread, eggs, cheese, and a case of Sprite. Sometimes writers will add an uppercase letter after a colon for a specific effect, or if the what comes after can stand by itself as a sentence. In the last case, the capped letter isn't needed. One exception would be this very post. Sometimes I'll lead into an example with a colon, but that's pretty much ending the sentence, and I'm beginning something brand new with the example sentence. #4: When do you use actual numbers such as 12:00 versus twelve o'clock? That's largely up to the publisher. I've seen it both ways, and which you use is really up to your editor and what style guide they're using. Neither is incorrect. I personally prefer to spell out times, because numbers pull me out of the text and remind me that I'm reading, while words feel more natural and keep me in the story world. But that's just me. Holy unplanned blog break, Batman! Life has swirled out of control the last while, and my poor blog (and blog reading) has suffered. I hope to be back on the bloggy bandwagon with my regular schedule soon. Okay, Now for Some BIG NEWS! If you're in Utah, tonight (that's Monday, March 29th) at 10:00 pm, tune in to FM 100.3. Rebecca Cressman will be hosting me and my friend Chris. We'll talk about Band of Sisters, supporting military families, promoting Elaine Dumler's Free Flat Daddy Project, and discuss what deployment is really like. Chris was an invaluable resource for me as I wrote the book, having gone through a deployment. She's facing their second one soon. Likewise, for Utah people, be sure to watch Good Things Utah on ABC4 this Wednesday, March 31st. The show airs for an hour at 10:00 am, and I'll be there with an actual Flat Daddy of a soldier currently deployed. That said, many others have been spreading the word about Flat Daddies and Band of Sisters, Krista even did an author interview with me, and I've come across a couple of really nice (and surprise!) reviews of the book. Pictures from the launch party coming soon . . . I swear . . . I think . . . yeah, that should happen at some point . . . probably . . . I've had two giveaways going on at the same time over here, and today I'm announcing the winners. The 25 preliminary winners go on to be part of the grand prize drawing for an Original OfficeBox and a copy of Rachelle's new novel, Wrong Number. This one was to encourage readers to spread the word about our super-successful Triple Book Launch (more to come on that in another post). Thanks again to every single person who came and supported us. It was such a great night! I promised a full set of my four temple novels (House on the Hill, At the Journey's End, Spires of Stone, and Tower of Strength) to the grand prize winner, plus two runner-ups who'd each get a copy of my grammar guide, There, Their, They're: A No-Tears Guide to Grammar from the Word Nerd. The four-book set goes to . . .
Alexis of One Cluttered Brain! She was bound and determined to win by getting as many entries as she could, even though she's not in Utah and couldn't attend the launch. Thanks for spreading the word, Alexis! 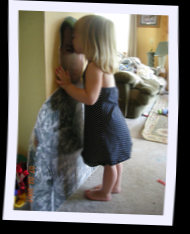 Prior to writing Band of Sisters, I watched a close friend go through her husband's deployment. We lived just around the corner from one another, and my youngest was the perfect age to play with her children. I was more than happy to fill in as a last-minute babysitter or lend my husband to fix a clogged garbage disposal or whatever. A couple of times, she used me as a listening ear, even though, much as I tried, I knew that deep down, I didn't (and couldn't) really have a clue what she was going through without facing a deployment personally. I like to think I was a little bit of a support to her, but the reality is, I felt pretty helpless and didn't know if there was anything I could really do to help her beyond being an on-call babysitter and having our family pray for hers. Her deployment experience led me to researching the topic more fully and talking to a number of military wives, and, ultimately, I felt compelled to write a novel about the topic. In the process, I found that many people (both those who personally know a military family and those who don't) wish for something specific they could do to help. They just don't know what. Then I landed on a blog that changed things. Eureka! Here was something concrete, something anyone could do that was simple in action but big on impact. 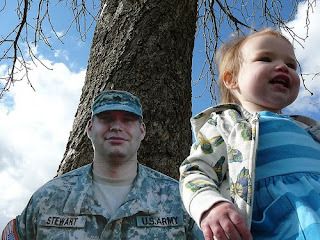 Flat Daddies (or Flat Mommies) are life-size photographs of the deployed parent. 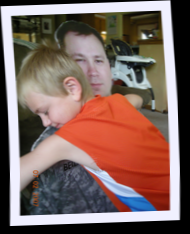 In a small but powerful way, a Flat Daddy can help ease the pain of the parent's absence. Children take their Flat Daddy to soccer games, kindergarten graduation, even trick-or-treating. Little girls have tea parties with "Dad." Boys can push "Dad" in a wagon and otherwise "play" with him. Young children can kiss him good night. The blog I first discovered the concept on is A Year with Flat Daddy, where an LDS woman nicknamed Mo recorded their family's journey with "FJ" (Flat Jared) while "RJ" (Real Jared) was in Iraq. Flat Daddies can really provide a strange sense of comfort in some situations and sometimes a little bit of comfort is enough to get through another day. I know that it was especially helpful for our daughter, who was very young when Jared left. She didn't shy away from him in the least when he came home and scooped her up. And "Daddy" was even her first word! Our oldest son has some special needs and doesn't adjust well to change, so the chance to have his "Dad" with him as usual helped ease his stress a bit. And I'll admit that on at least one occasion I put my arms around Flat Jared's neck and cried my eyes out. It was more comforting than crying in a pillow, to be honest. Carrying a Flat Daddy with you really does bring out the best in people. I experienced such gratitude and kindness from complete strangers, people who wanted to connect with us and really be a part of our family's little adventure. I am so grateful for Flat Daddies. I had heard of the concept before, but the cost is prohibitively high if you try to make one yourself at a local copy shop. Having a place that makes it easy and affordable—or free for a family going through a deployment—is a great blessing. 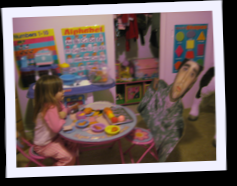 The Flat Daddy® concept is the brainchild of Elaine Dumler, who originally came up with it as one of many ideas for military families in her book, I'm Already Home. The idea took off, and through her efforts, she became known as the "Flat Daddy Lady" and got an award from ABC for her work supporting military families. She's since written a second volume with even more great ideas, I'm Already Home . . . Again. You can buy her books from her website (above). I'm now working with Elaine to help get as many Flat Daddies as possible into the hands of families who could benefit from them. 1) Buy a Flat Daddy® for a family they know. 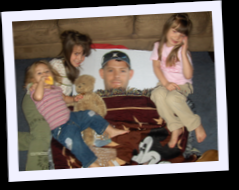 2) Buy a Flat Daddy® for an anonymous family. Those options are still available. But having them as the only options presented a slight problem: Not everyone who wants to help can pay out the cost of making and shipping a Flat Daddy. They cost nearly fifty dollars a pop. Anyone can now donate to the Flat Daddy Project in any dollar amount they choose. That money goes toward the creation of future Flat Daddies. If you can afford to go without a fast-food lunch once this week and donate five dollars, great! If you can donate ten or twenty dollars (or more!) on another day, even better! Whatever you can give will add up. Finally: something you can do, more than once, even, to support military families, and it won't break the bank. To donate, visit the Flat Daddy® page on my website and follow the directions. That page also shows pictures of Mo's family with Flat Jared and features a clip from their local news about their experience. Be sure to drop by; it's worth checking out. NOTE: To buy a Flat Daddy® for a family you know, be sure to get their e-mail address. As you check out, you'll be prompted to enter the e-mail address. After your payment is cleared, the family will be sent a code they'll use to claim their Flat Daddy® at no cost to them. If you weren't excited for the Triple Book Launch Party YET . . . you will be after reading this post. The nearly lost art (truly an art!) of hand-bound books is alive and well at Pendragon's Book Binding. Their work is stunning, high-quality, and costs about half what similar companies typically charge. One winner gets a hardbound journal, 8.5" X 5.5" with 160 sheets (320 writing pages). The actual journal made especially for the launch party is pictured below: hand-sewn binding with red butterfly paper and a black suede spine! They have a ton of choices for cover styles (fabric, paper, photos, soon even leather) and you can have the book blank or have them print your own book inside for a family heirloom. Retail value: Through other channels, about $40. Through Pendragon's, $20. Just as the name suggests, Lola's Lovelies has lovely, hand-made hair accessories. Door Prizes: TWO skinny wrapped headbands with decorative flowers on the side: one purple. 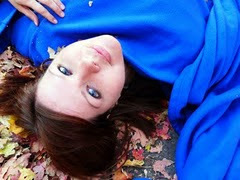 the other blue! Both have been specially made just for the launch party and our readers. Visit her blog for more "hair lovelies" HERE. One winner will receive copies of both Lost Without You and At the Water's Edge, my first two books, which are out of print and therefore hard to find (but will soon be available on the Amazon Kindle!). 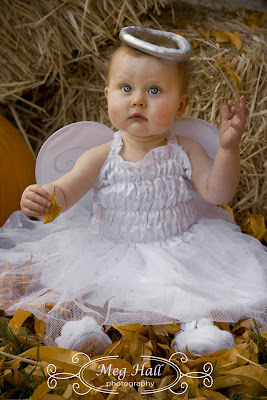 One winner will get a free family photography sitting, along with a disc of the images and a copyright release letter so you can make as many copies of any photo you like. 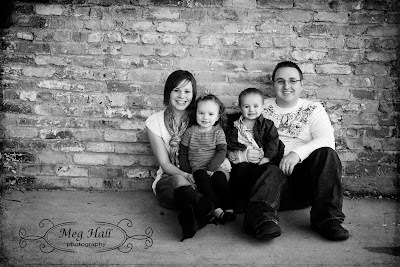 Visit Meg Hall Photography to see more of her awesome work! We have THREE cool products for GUYS, using all-natural products and fragrances (essential oils, for example. Not the fake stuff). Whether we give them all out together or separately is yet to be determined: Lemon soap, Bay Rum aftershave (which I hear smells just right: not too strong or weak and is oh so good), and a shaving bar. They're all packaged and sealed with wax in the company's trademark wooden containers. Become of a fan on Facebook HERE. This great company can customize any vinyl lettering project just for you. One winner will receive $20 gift certificate for anything on the Walls of Wisdom Home site. SEVERAL OTHER winners will receive vinyl lettering ready to put on a wall with awesome quotes about reading and books. Visit Walls of Wisdom Home to see more of their products. My FAVORITE gourmet popcorn company, Colorado Kernels (located in Orem) is donating TWENTY-FOUR mini bags for door prizes. Holy smokes, it'll be all I can do not to rip into them myself. Just trust me on this one. You want to win one of their bags! Go ahead and salivate over their flavors HERE. Convinced yet? Hope so! We have more prizes in the works; these are the ones we have confirmed so far. So please come . . . and spread the word!